In this blog I will discuss what value and reference types in C# are and how we pass them as value and reference. Value Types - all numeric data type, boolean, char, datetime, structure (even if their member is ref type) and enum. Object data type is special. It can hold both ref type value or value type value. Object variable always holds a pointer to the data and never the data itself. However, if we assign a value type to an Object variable, it behaves as if it holds its own data. Passing by val - when we pass by value a copy is passed and the original value is not changed. Passing value type as value - any change that take place inside the method have no effect on the original value since a copy is passed. Passing ref type as value - if we pass a class instance, since its ref type, changing property values will affect the original source also. However, the attempt to reassign the instance to a different memory location (like doing a new) only works inside the method and does not affect the original instance. Passing by ref - by using ref or out keyword. Enables us to change the value in a passed environment and persist those changes in the calling environment. 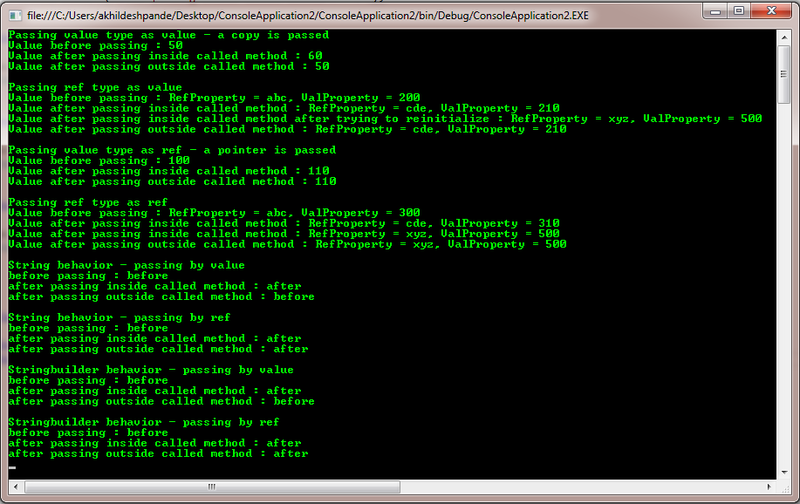 Passing value type as ref - any change that take place inside the method is reflected on the original value as well. Passing ref type as ref - if we pass a class instance, since its ref type, changing property values will affect the original source also. Unlike passing ref type as value, attempt to reassign the instance to a different memory location (like doing new) works inside the method and also affects the original instance. String - string are reference types but their behavior is slightly different. strings are immutable - that means that contents of a string object can't be modified once created. When we do that the compiler actually creates a new string object to hold the new string and that new object gets assigned to the original variable. string passed as value - altering the string in the called method alters locally since its created new and the original string is not changed. string passed as ref - altering the string in the called method alters the original string as well.